(TNS)—Make a great first impression on visitors to your home with an aesthetically pleasing driveway. The materials you select to pave your driveway affect the job’s price. The materials used also affect your home’s curb appeal and resale value. Check out how these popular driveway options differ to ensure you’re making the best choice. 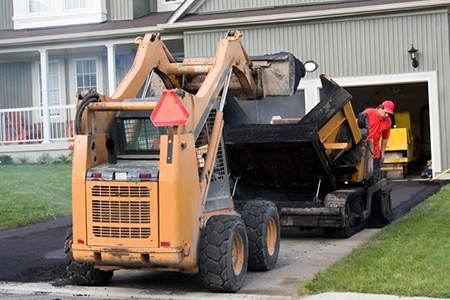 Contractors consider asphalt one of the cheapest options. Paving an asphalt driveway ranges from $2,300 to $10,300, according to costhelper.com, and Angie’s List members nationally reported an average price of $5,308 to pave an asphalt driveway. If homeowners reseal the asphalt driveway every three years, it will last about 20 years, according to the National Asphalt Pavement Association. Asphalt should be 3 inches thick when used over gravel for new driveways, and 2 inches thick when repaving, Leggett says. Some contractors disagree, but he argues thicker is better. If properly maintained, a concrete driveway can last for about 30 years and continue to cure and harden, says Prisciliano Anaya, president of Anaya Concrete in Denver. “Concrete that’s eight years old is much stronger than concrete that’s two years old,” he says. Concrete driveways should be at least 4 inches thick to support regular vehicles and at least 5 inches thick for heavier trucks, according to the American Concrete Pavement Association. Concrete driveways cost more, starting around $3,500, according to costhelper.com. Angie’s List members nationally reported an average price of $7,394 to pave a concrete driveway. But concrete requires less maintenance than asphalt, Anaya says. He advises homeowners to watch for soil erosion on either side of the driveway, avoid using de-icing chemicals and opt for a sealer to protect their investment. Also, sealing cracks in the control joints running through the slab will prevent water from seeping underneath. Both clay and concrete pavers feature impressive strength, says Frank Calistro, owner of Old World Brick Paving in River Grove, Ill. Concrete pavers come with a strength rating of 9,000 pounds per square inch, and 12,000 psi for clay, he says. Concrete driveways usually use 4,000 psi of cement. However, some differences exist. Clay pavers feature a deeper, more vibrant color than concrete pavers, Calistro says. Clay pavers sometimes cost twice as much, and unlike concrete pavers, they only come in one shape, he adds. Concrete paver driveways sometimes cost up to $14,500, while clay brick driveways can reach $28,000, according to costhelper.com. Both require little to no upkeep, though concrete pavers require sealing every five to seven years, Calistro says. If the base was properly installed, they should last for decades, he adds. Homeowners also can add decorative elements to concrete and asphalt driveways. One common option involves stamping a pattern into the materials, creating a faux paver. But adding a single decorative element can add thousands to the price. Choosing a type of driveway depends on the homeowner’s needs and tastes, Leggett says, admitting he’s a little bit biased. James Figy is a reporter for www.angieslist.com, a trusted provider of local consumer reviews and an online marketplace of services from top-rated providers.